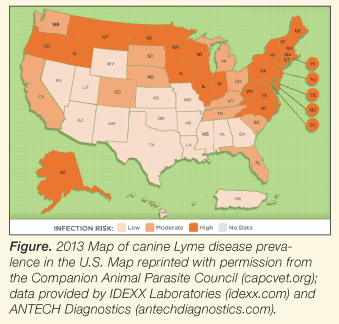 Canine Lyme Disease: How Real is the Threat? 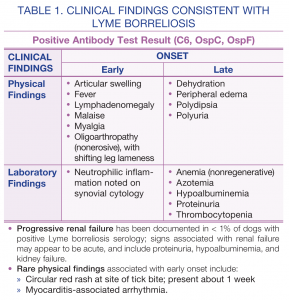 Canine Lyme borreliosis continues to generate considerable controversy in clinical practice, particularly as it pertains to risk for exposure, diagnosis, consequences of infection, and even prevention. Drs. Ford and Eschner address each of the key controversies and current recommendations regarding management of dogs at risk for canine Lyme borreliosis. Canine Lyme disease, also called canine Lyme borreliosis, is among the most familiar tick (Ixodes species) transmitted infections known to occur in humans and dogs residing in North America. Despite being the subject of review articles,1,2 research studies, scientific proceedings, and symposia, canine Lyme borreliosis continues to generate considerable controversy in clinical practice, particularly as it pertains to exposure risk, diagnosis, consequences of infection, and even prevention. This article addresses key controversies and current recommendations regarding management of dogs at risk for canine Lyme borreliosis. The host-associated bacteria—Borrelia burgdorferi, a spirochete—is maintained in a variety of wild animal reservoirs, ranging from rodents (principally the white-footed mouse), other small mammals (eg, chipmunks), and ground feeding birds (eg, American robin). The black-legged tick, or deer tick, which parasitizes the mammalian and avian hosts, unwittingly serves as a vector of B burgdorferi to other mammals, including dogs and humans. White-tailed deer—often associated with Lyme disease—are not reservoirs for B burgdorferi. They are, instead, blood-feeding stations (and transport vehicles) for adult black-legged ticks. In recent years, increased deer tick populations are believed to be a result of similarly increased deer populations. Canine Lyme borreliosis is not a reportable disease; therefore, precise estimates of disease prevalence are unavailable. However, compared with humans, dogs in endemic regions are at substantially greater risk for exposure to infected ticks. Surveillance reports of dogs with positive antibody test results suggest that up to 85% of dogs living in endemic areas are at risk for B burgdorferi infection. Today, risk extends beyond the traditional geographic boundaries defined—the New England states, Wisconsin, and Minnesota, with a relatively high number of infected dogs reported annually in northern California, Oregon, and parts of Washington State (Figure).4 Anecdotal reports from veterinarians practicing in western Pennsylvania, Ohio, Michigan, and central Illinois state that, over the past 5 years, risk for exposure to infected ticks is spreading. Results of surveillance studies in the U.S., Canada, and Europe designed to monitor the spread of infected ticks indicate that both climate change and migratory ground-feeding birds contribute to movement of infected ticks and increased risk for human and animal exposure.4-6 These studies highlight the importance of continued surveillance—through routine testing of dogs living in regions where the risk for exposure to Ixodes species ticks is high. What does a positive test result really mean? Does a dog infected with Lyme borreliosis derive long-lasting natural immunity to it? 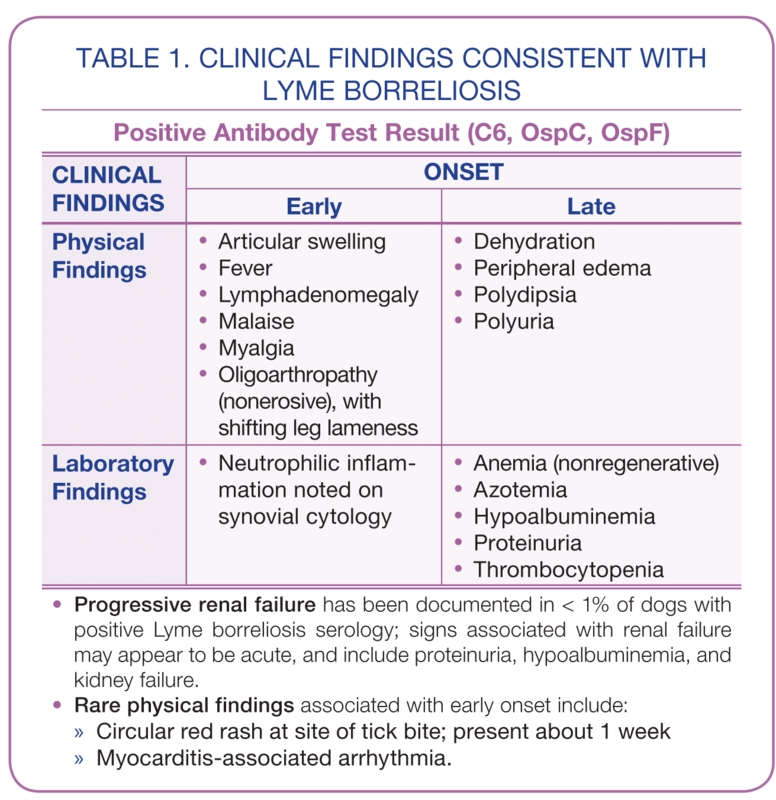 Should a dog with a positive test result, but no clinical signs be treated for Lyme borreliosis? Should a dog with a positive test result be vaccinated for Lyme disease? These questions, and others, are addressed in the sections that follow. Positive test result on both an enzyme immunoassay (or immunofluorescence assay [IFA]) and an immunoblot test (Western blot). Treatment is indicated only when all 3 criteria have been documented. In 2006, a consensus statement on Lyme disease in dogs, which addressed a series of questions on the diagnosis, treatment, and prevention of the disease, was published by the American College of Veterinary Internal Medicine.1 However, that document failed to provide a clear definition of what constitutes a diagnosis of canine Lyme borreliosis. The recent introduction of laboratory-based and point-of-care testing technologies has added to the confusion over whether treatment is indicated when a serologic test result is positive in a dog. Point-of-Care Tests. For over 10 years, point-of-care tests (SNAP 4× and SNAP 4D× Plus, idexx.com) have been available to detect antibodies to the highly conserved C6 peptide of B burgdorferi. With high sensitivity and specificity, this rapid assay is an excellent surveillance tool for identifying dogs that are infected with B burgdorferi, and is particularly valuable to screen dogs within areas where Lyme disease is emerging. None of the commercial Lyme disease vaccines cause false positive C6 test results. A positive test, however, cannot be used to predict the clinical outcome of an infected dog. Another laboratory-based diagnostic test (AccuPlex4, antechdiagnostics.com), introduced in 2012, has the ability to detect 5 different antibody responses to B burgdorferi infection (OspA, OspC, Ospf, p39, and OspF). The test also reportedly differentiates between natural exposure and vaccination as well as distinguishing early from chronic infection. Consistently and reliably detect vaccine-induced antibody (OspA); therefore, at this time, these results should not be considered when interpreting a report. Determine whether the dog resides in, or has traveled to, a region inhabited by the Ixodes tick. Urine protein:creatinine ratio (UP:UC), if proteinuria is deemed significant. With uncomplicated Lyme borreliosis, hematologic and biochemical abnormalities are unlikely. However, seropositive dogs are at risk for co-infection with other vector-borne pathogens and may have underlying laboratory abnormalities (eg, thrombocytopenia, anemia, hypoalbuminemia). Significant laboratory abnormalities, revealing serious underlying renal disease (see Lyme Nephropathy), can exist in the absence of expected physical abnormalities (eg, lameness). Believed to be an immune-mediated disease, the pathogenesis of lyme nephropathy remains unknown. The most commonly affected breeds include Labrador retrievers, golden retrievers, and Shetland sheepdogs; however, any breed or mixed-breed may be affected. A critical factor in diagnosis of lyme nephropathy is proteinuria, and assessing every seropositive patient for proteinuria (including a UP:Uc) is an important component of laboratory evaluation. A reasonable history of exposure to Ixodes species ticks. 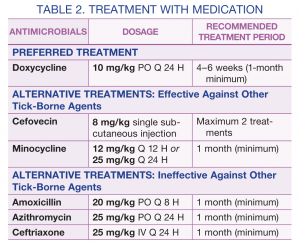 Treatment with an oral antimicrobial is indicated in any patient meeting the above criteria, and oral doxycycline is the preferred therapeutic approach to Lyme borreliosis (Table 2). Most authors agree that dogs exhibiting lameness and/or myalgia resulting from B burgdorferi infection will rapidly improve within 3 to 5 days. An advantage of using these drugs is that they are effective against other tick-borne agents frequently carried by ticks, and patient co-infection with more than one agent is common, with signs mimicking Lyme borreliosis. 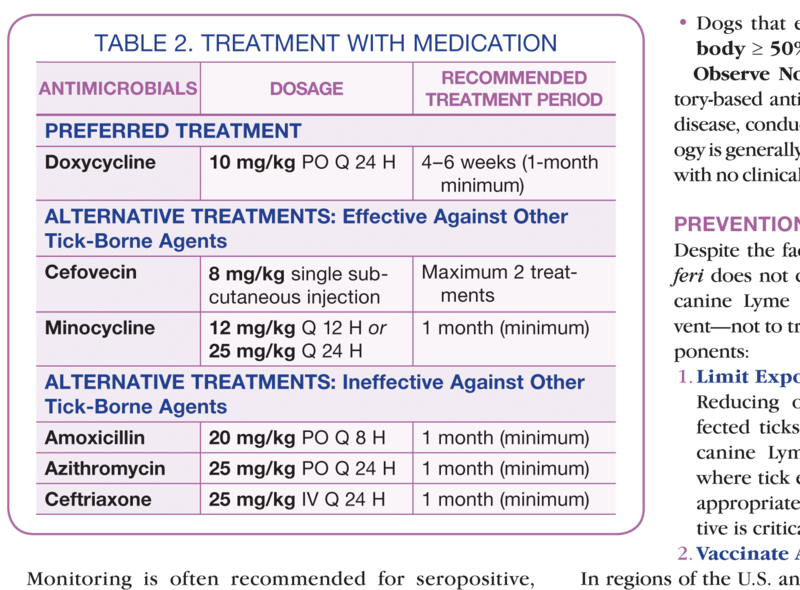 The other alternative treatments listed in Table 2 are not effective against these other tick-borne agents. It is important not to discontinue treatment earlier than recommended, even if clinical signs rapidly resolve. Also, although clinical signs may rapidly resolve with treatment, none of the antimicrobials outlined in Table 2 are known to clear B burgdorferi from tissue. In contrast, veterinarians practicing in nonendemic areas of the U.S. tend to avoid treatment unless clinical signs are present at time of testing. 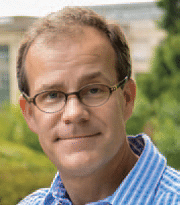 Lack of clinical signs makes it difficult to evaluate response to antimicrobial therapy. Response to Therapy. One option for monitoring these dogs is to perform the laboratory-based quantitative C6 test. In addition to monitoring changes in C6 following antimicrobial treatment, a quantitative titer can also provide information on re-infection. Dogs with pretreatment quantitative titers ≥ 30 U/mL can be monitored for response to treatment by measuring reduction in C6 antibody concentration 6 months after treatment. Dogs that experience reductions in antibody ≥ 50% have responded to treatment. Observe Nontreated Dogs. Because laboratory-based antibody tests cannot predict clinical disease, conducting routine or quantitative serology is generally not useful in seropositive patients with no clinical signs or laboratory abnormalities. Cost of treatment and post treatment monitoring can be significant for the pet owner. Antimicrobial treatment, regardless of the drug used, is not expected to clear bacteria from tissue, and therapy is not entirely free of adverse consequences. Health consequences of long-term infection, particularly dogs subject to re-infection, are unknown. Natural immunity to B burgdorferi is short-lived and does not provide significant or sustained protection for pets re-exposed to infected ticks. Reducing or eliminating exposure to infected ticks is the core strategy to prevent canine Lyme borreliosis. Even in regions where tick exposure is considered minimal, appropriate administration of tick preventive is critical. In regions of the U.S. and Canada known to be endemic for ticks infected with B burgdorferi, vaccinate dogs in these areas annually. Vaccination is not routinely recommended for dogs living in nonendemic regions (eg, Colorado, Utah, New Mexico, western Canada). Instead, appropriate use of tick preventives reasonably manages any exposure risk. Based on results of in vitro studies, some products (whole-cell bacterins) claim provision of expanded protection due to the addition of OspC antigen. However, OspC antibody has not yet demonstrated in vivo protection against infection when independent from the OspA antibody. 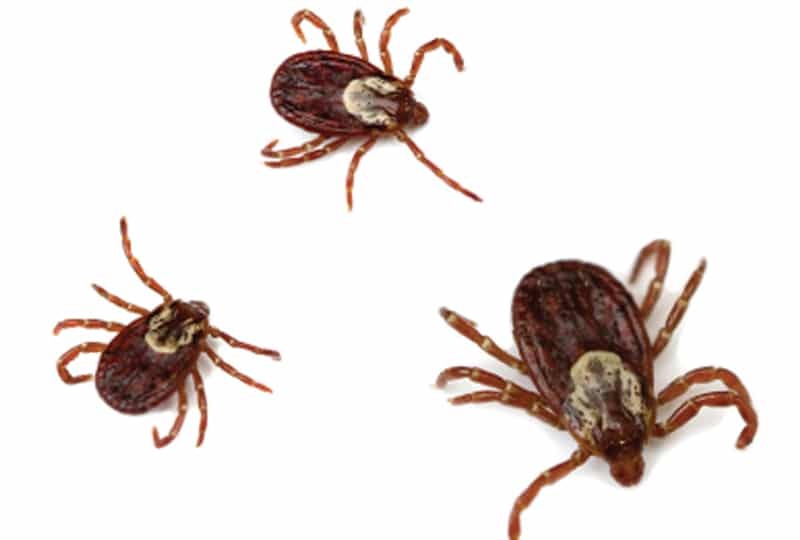 Encourage owners to avoid traveling with their dogs to regions inhabited by the Ixodes tick. However, if dogs must travel to, or reside within or in the periphery of, Lyme endemic regions, especially during period of increased tick activity (spring/summer/fall) highly recommend application of a tick preventive as well as vaccination. Conventional vaccination protocol involves administering 2 initial doses, 2 to 4 weeks apart. The second dose is administered 2 to 4 weeks later. After the initial 2-dose series, annual boosters are recommended if the risk for exposure is sustained. Some authors recommend an early booster dose—administered 6 months following completion of the initial 2-dose series—for dogs living in known endemic regions. Compared to most virus vaccines, the immunologic memory subsequent to Lyme disease vaccination is relatively short-lived. Therefore, the initial 2-dose series should be repeated if a dog with reasonable risk for exposure has not received a booster dose in over 2 years. Serologic testing for antibody to B burgdorferi is an established, valuable tool for identification of infected dogs. Routine, or surveillance, testing of healthy dogs living in areas of the U.S. and Canada adjacent to known endemic areas are key in assessment of emerging infection risk. Canine Lyme borreliosis is a disease to prevent—not treat. Antimicrobial treatment to clear B burgdorferi from the tissues of infected dogs. Ideally, preventive measures include early and compliant vaccination and year-round tick control for all residing in endemic regions. Serologic surveillance testing of healthy dogs, combined with vaccination and tick control, offer the most comprehensive approach to reduce risk for infection and disease caused by B burgdorferi. The article—Vaccinating Dogs Against Lyme Disease: Two Points of View (January/February 2014)—addressed 2 different viewpoints regarding controversies surrounding Lyme disease vaccination (available at https://todaysveterinarypractice.com/article.asp?articleid=T1401C06#article). This sidebar addresses 2 common concerns—both regarding safety—that contribute to the vaccine controversy. For small breed dogs, current vaccine guidelines11 recommend administering noncore vaccines, such as Lyme disease vaccine, 2 weeks (or longer) after administration of core vaccine(s). This practice may not be feasible, though, for young dogs at high risk for exposure within endemic regions. Whole-cell bacterins may be more likely to cause acute reactions (associated with excipient proteins) compared with the recombinant vaccine.2,12-14 If young or small breed dogs must be vaccinated, the recombinant Lyme disease vaccine may minimize risk for acute adverse reaction, particularly when other vaccines are administered during the same appointment. Some speculate that Lyme disease vaccination contributes to renal injury (ie, Lyme nephropathy). The reasoning for this concern stems from Lyme nephropathy’s association with Lyme-specific circulating immune complexes (CICs), and the fact that Lyme disease vaccination can cause a transient increase in CICs. Hundreds of thousands of doses of Lyme disease vaccine are sold and administered to dogs throughout North America every year, yet cases of Lyme nephropathy are uncommon. In unvaccinated dogs, the rise in CICs following vaccination is transient (days), yet Lyme nephropathy appears to be a delayed manifestation of B burgdorferi infection. The role of co-infections (Anaplasma species) in the pathogenesis of Lyme nephropathy has been raised. Greene CE, Straubinger RK, Levy SA. Borreliosis. In CE Greene (ed): Infectious Diseases of the Dog and Cat, 4th ed. Philadelphia: Elsevier Saunders, 2012, pp 447-465. Ogden NH, Maarouf A, Barker IK, et al. Climate change and the potential for range expansion of the Lyme disease vector Ixodes scapularis in Canada. Int J Parasitol 2006; 36(1):63-70. Lindgren E, Jaenson TGT. Lyme borreliosis in Europe: Influences of climate and climate change, epidemiology, ecology and adaptation measures. World Health Organization Europe, 2006; available at www.euro.who.int/__data/assets/pdf_file/0006/96819/E89522.pdf. Liang FT, Jacobson RH, Straubinger RK, et al. Characterization of a Borrelia burgdorferi VlsE invariable region useful in canine Lyme disease serodiagnosis by enzyme-linked immunosorbent assay. J Clin Microbiol 2000; 38(11):4160-4166. Levy SA, O’Conner TP, Hanscom JL, et al. Quantitative measurement of C6 antibody following antibiotic treatment of Borrelia burgdorferi antibody-positive non-clinical dogs. Clin Vaccine Immunol 2008; 15(1):115-119. Philipp MT, Bowers LC, Fawcett PT, et al. Antibody response to IR6, a conserved immunodominant region of the VlsE lipoprotein, wanes rapidly after antibiotic treatment of Borrelia burgdorferi infection in experimental animals and in humans. J Infect Dis 2001; 184(7):870-878. Grauer GF, Burgess EC, Cooley AJ, Hagee, JH. Renal lesions associated with Borrelia burgdorferi infection in a dog. JAVMA 1988; 193(2):237-239. Welborn LV, DeVries JG, Ford RB, et al. 2011 AAHA canine vaccination guidelines. JAAHA 2011; 47:1-42; available at www.jaaha.org. Appel M, Jacobson R. CVT update: Canine Lyme disease. Kirk’s Current Veterinary Therapy XII: Small Animal Practice. Philadelphia: WB Saunders, 1995, pp 303-308. Littman MP. Lyme nephritis. J Vet Emerg Crit Care 2013; 23(2):163-173. Richard B. Ford, DVM, MS, Diplomate ACVIM & ACVPM (Hon), is Emeritus Professor of Medicine at North Carolina State University’s College of Veterinary Medicine. He is a past president of the NAVC Conference and is a member of the scientific program committee. He serves on the AAHA Canine Vaccination Task Force and AAFP Feline Vaccination Advisory Panel. He received his DVM from Ohio State University and completed an internal medicine residency at Michigan State University. Andrew Eschner, DVM, is the Senior Technical Services veterinarian for Merial and serves the New England area. Dr. Eschner works regularly with the field sales group and customers, interfaces with marketing, and consults with practicing veterinarians and institutions of higher learning. 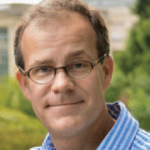 He has worked as a veterinarian in small animal practice as well as authored and co-author many publications on canine Lyme borreliosis. Dr. Eschner received his DVM from Cornell University.